Daniel "Bubba" Franks came to Miami out of Big Spring High School in Big Spring, Texas with many talents...the most prominent...the ability to catch the football. In high school, the All-State team captain not only played tight end, but defensive end and he returned punts and kickoffs. But it would be that ability to use his hands that would make its mark on the Hurricanes football program. In 1997, Franks would lead the team with 4 touchdown receptions while catching 19 passes for 294 yards. He caught the game-winning catch in Miami's thrilling 45-44 double overtime victory against Boston College. He also caught fans attention with a one-handed grab against West Virginia, hauling in five passes in the third quarter alone, even though the Mounteneers double-teamed him all day. He would be named a 1997 2nd team All-Big East selection. In 1998, he added 13 catches for 179 yards and 3 touchdowns. He had his finest season in 1999 with 45 catches for 565 yards and 5 touchdowns; in six games he had at least 5 catches. 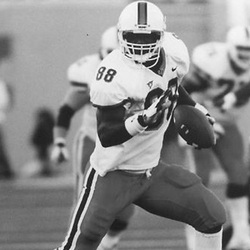 Bubba was named the 1999 Jack Harding Award winner as the Hurricanes Most Valuable Player. He was a two-time first team All-Big East selection ('98 & '99) and in 1999 was named a first team All-American by The Sporting News and The Football News, and a 2nd team All-American selection by the Associated Press. His 12 career touchdown passes caught is a UM record for tight ends, and he is tied for 6th all-time among receivers, along with fellow inductee Jim Cox. For his career, he amassed 77 receptions for 1,038 yards for a 13.5 yards average per catch. Born in Riverside, Ca., Franks was drafted in the first round of the 2000 NFL draft by the Green Bay Packers (14th overall), he would be a 3 time Pro Bowl selection in his 9 NFL seasons, catching 262 passes for 2,347 yards and 32 touchdowns. He played for the Packers (2000-2007) and the New York Jets (2008). Bubba has a son, Daniel II and a daughter Sienna.